First off, I decided to label this post as an "Event Report" as opposed to "Race Report" because somehow it didn't really feel like a race. It was more of a personal journey for everyone there. It never really felt like we were racing each other. I went into this event with as open a mind as I thought I could. Truthfully, I was worried that I would not find much enjoyment out of it and had questioned my decision to sign up for it many times. I decided it was pointless to be negative and instead just see how things went. The beauty of a timed event is that there is no pressure to do anything. You can run for 3 hours and stop...and you're still a finisher. My goal was to simply go out the first morning and run until I felt like stopping, and then take it from there. I truthfully had no idea what to expect and didn't want to go crazy on account of my recent nagging foot/knee issues. 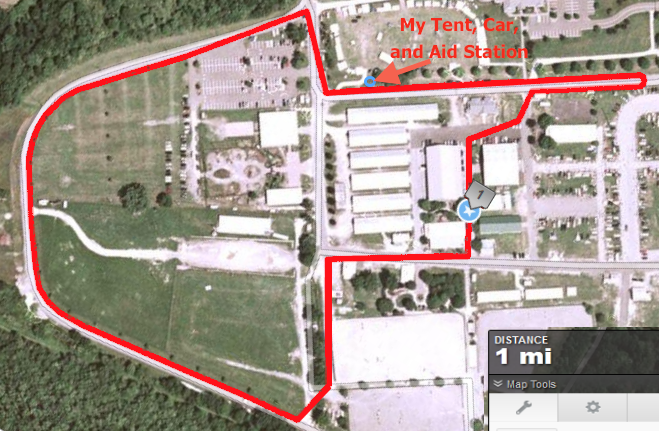 I made the 3.5 hour drive out to the NJ fairgrounds on Wednesday evening and set up my tent along the 1-mile loop. I had a strategy to set it up as far from the start of the loops as I could so that when I took breaks, I would already be 1/3 of the way done with another loop. The loop was about 90% pavement with a small section of dirt and grass. There were parts of the course you could run along the side of the pavement if you wanted to, but most people actually didn't. I didn't get much sleep Wednesday night, but it was enough (with a little coffee help). After getting set up and changed, all of the 72-hour runners met at the start of the loop and received instructions from the race director. 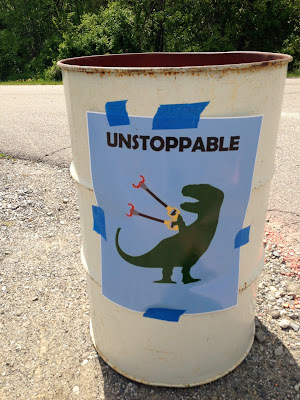 It was simple: Follow the 1 mile loop markers, and repeat. Aid was available at the start of each loop if you desired. Because of this, I opted to carry nothing except an occasional water bottle when I wanted to be able to go non-stop for a few laps. We all started running at 9:00 am Thursday morning when the horn sounded, and just like that we were moving, and the clock was running. 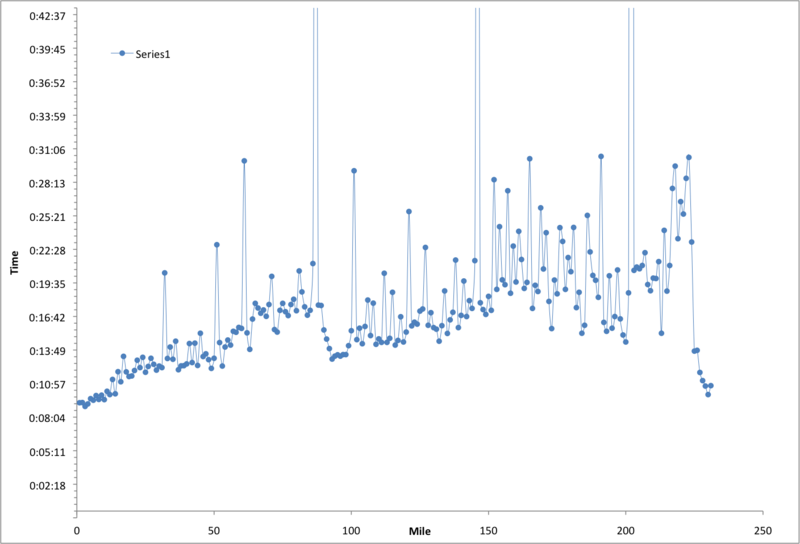 I figured I'd try to settle into a 9-10 minute/mile pace for the first 10-20 miles or so, and then take it from there. Very quickly I lost track of who was on what lap, so I had no idea of my placement. Later, the director started posting time sheets every hour, but I didn't even start looking at them until almost the 2nd day. Throughout the morning, I mostly kept to myself. I ran the first 10 miles at roughly a 9:30 pace, and was simply trying to take in the "looped" experience. I stopped at my car a couple times to get a few things, but the aid station had the same gels that I normally use. I was able to fuel on mostly gels and fruit for the majority of the morning and early afternoon. By about 2 PM the heat was getting to everyone. It had reached the low 80's, but the humidity was right up there. It was hot, sticky, and there was virtually no shade on the course. Everyone slowed down through those afternoon hours. I put on my sun-hat, lathered on the block, and decided to power-hike a few laps. I figured if I were going to keep at it for 72 hours, a good strategy would be to hike some laps early to help minimize the running damage. I also made sure to sit in my chairs every 5-10 laps and elevate my feet for at least 5 minutes. Occasionally I foam-rolled and tried to be vigilant about keeping stretched and loose. At some point around mile 30 I hit a snag. My right knee started acting up. My heel was doing great, my toe was pain-free, but the knee was biting. I could walk ok, but running made it hurt just like it did last year. I switched over to my Hokas hoping that would help relieve some pressure, but I ended up having to walk several miles. It got to the point where I considered just stopping for a long while as walking for three days seemed pointless. Perhaps a very long break would make it feel better. I kind of figured that if it couldn't work itself out while moving though, taking a break would likely only offer a temporary relief, so I chose to keep moving for a bit before I came to a final decision. Finally, a couple of hours later, and after walking several laps, the pain started to ease up and I found I was able to jog again. I took it very conservatively for many miles, before finally running. This whole scenario slowed me down a lot, but it was worth it. I don't know if it was simply slowing down, if it was changing to the Hokas, or if the kinks finally got worked out, but the knee pain subsided. I worried a bit that it was something like a burst appendix....my knee stopped hurting because whatever was hurting finally snapped, but I likely wouldn't be able to run if that were the case. By about 7 pm, I was ready for a real meal, and the cooler temps. 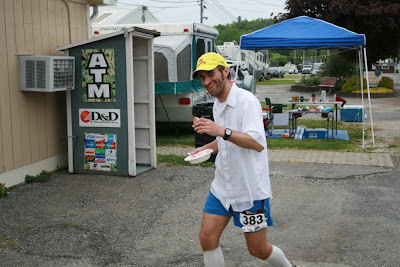 I spent some time at the aid station eating some quality sandwiches and pizza, and took my first long break of about 20-30 minutes. It felt great to rejuvenate. Afterwords, I was out running again for several hours, and knocking out considerable miles. On several occasions I swapped in and out my trekking poles for a little change of pace, and I began listening to some audiobooks. I was looking forward to the wee hours. The course is lit by street lamps, so no headlamps are needed...which was also a bonus. At some point around 3 am, I decided it was time to drop down for a little nap. I had zero intention of trying to pull off some sort of Barkley 60-hour sleep deprivation, so I knew I would need a couple of sleep breaks. 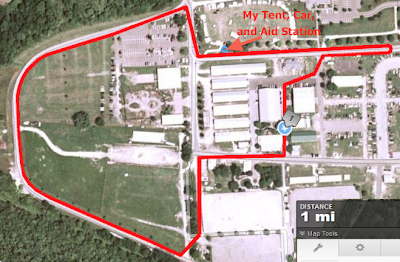 At mile 86, I curled up into my tent for about an hour and fifteen minutes. I woke in a panic somehow confused by what day or time it was. I got set up and when I stood up I was ridiculously stiff. I made my way around the loop hobbling horribly and shivering terribly. I was not dressed for the cool temps. At the station, I ate some hot soup, stretched out, and within two more loops, I was comfortably running again. It's amazing that as horrible as my legs felt when I first got up, I was running just two miles later. I had a soft goal of trying to get near 100 miles in the first day. 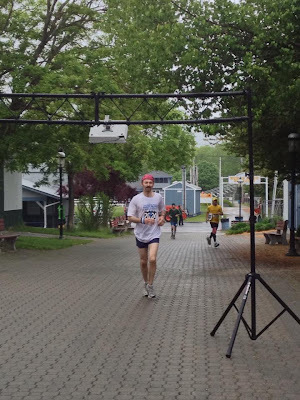 At 9:00 am when the 48-hour runners were lining up to run, I came across the timing gate at mile 95. I was completely satisfied with this distance covered the first day (and even with over an hour of napping, several breaks, and all the knee issues). It was weird after having spent an entire day seeing the same people, to all of a sudden have a new surge of fast runners join the mix. Most of us 72'ers, were jogging slowly, or walking regularly by this point, but the 48'ers were fresh and eager just as we were a mere 24 hours prior. 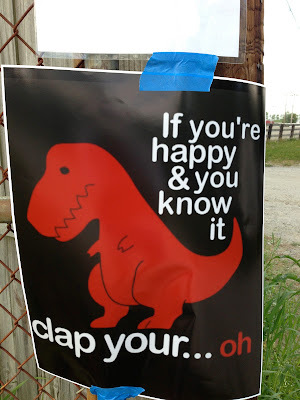 I laughed at this and just continued with my shuffling. 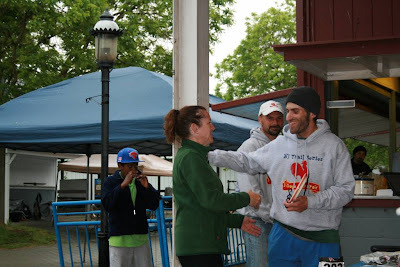 After hitting 100 miles at about 25 total hours, I finally started opening up to other runners. I began learning first names and spent a lot of time running alongside different people. I wanted to understand people's reasons for being there. What I found was that everyone saw the event as a matter of personal triumph. Almost everyone had a goal of what they wanted to accomplish, but what I found was that most people also a "secret goal" that they had tucked away. These goals were harder for people to admit early on during the event when they seemed so far away. As the miles ticked by though, more and more people began opening up about the ultimate secret goals. It was absolutely inspiring to experience. There were people from all walks of life out there. People that you'd never expect to be participating or expect to be capable of going 100 miles...yet there were out there, and they were doing it. I watched as 8-year old kids covered 50+ miles and 75 year-old overweight grandmothers walked their way to 100 miles. People truly are capable of amazing things and as Ken Chlouber (Leadville) would say, "We can all do more than we think we can". We were all hoping for a cooler day, but by around noon what little cloud cover we had began to burn off and we were looking to have another hot one. Throughout the afternoon I opted to slow things down a bit and take lots of "shade-breaks". I was surprised to learn that when I finally did check my laps, that I was in the top 5 overall. I knew that Darren Worts (who had 270 miles last year) was doing fantastic, but I didn't think I was anywhere near the top. I spent the remainder of the day taking it easy and eating a lot. I took breaks where'd I'd walk 2 or 3 laps, and then jog a few. My feet were starting to get pretty sore at this point too, and I couldn't even put on my other shoes. It appeared it would be the Hokas or nothing. Later that night I told myself I wanted to get to 150 before napping, but at mile 146 I couldn't really keep my eyes open. I slogged up to my tent for about about a 1.5 hour nap sometime around 2 am. 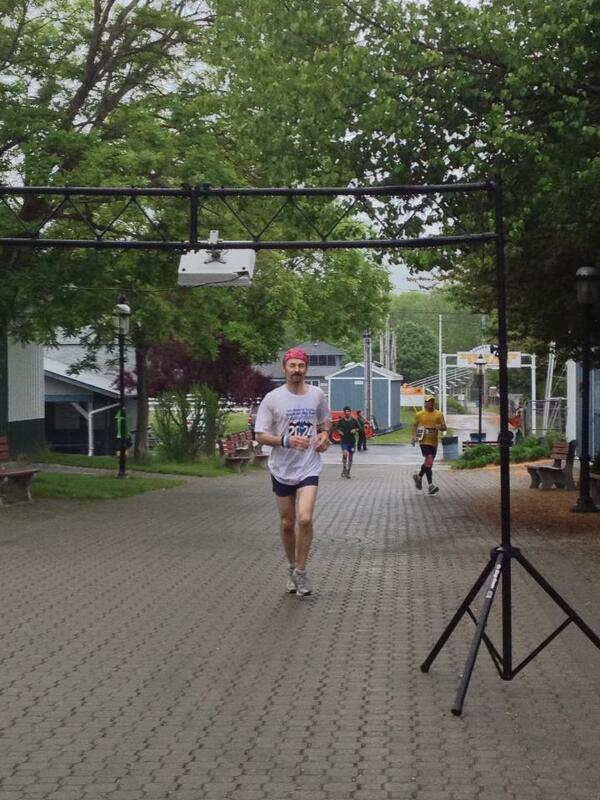 Getting up from this 2nd lap was real tough and I hobbled for at least 3 laps before getting loose again. The nap did nothing for my fatigue though and I found I needed coffee to function. During the wee hours I struggled to stay awake and found myself sleep-walking a lot. I tried desperately to listen to my audio books but found myself having to replay bits over and over because I kept missing the story. Finally at about 5 am I could see some daylight and my body began to wake up a bit. 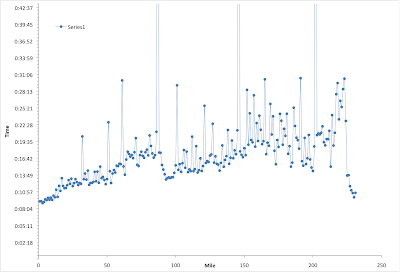 When I crossed the timing gate at 9:00 at the start of the 24-hour race, I had totaled 70 miles for the day, and 165 for the two days. I immediately walked around to my car and power napped in my chair for about 30 minutes. By mid-afternoon I found I was running a lot with Dave Lettieri, who I found was right about the same mileage as me. We had similar plans and approaches. We both found ourselves stuck in the endless 80's as we called them. It seemed like every mile between 180 and 190 just wouldn't come and we would never hit 190. When we finally did, we found some new vigor in our steps and before we new it we were approaching the magical 200. I was struggling bad with the lack of sleep at this point and told him that at 200 I was going to get some real sleep. 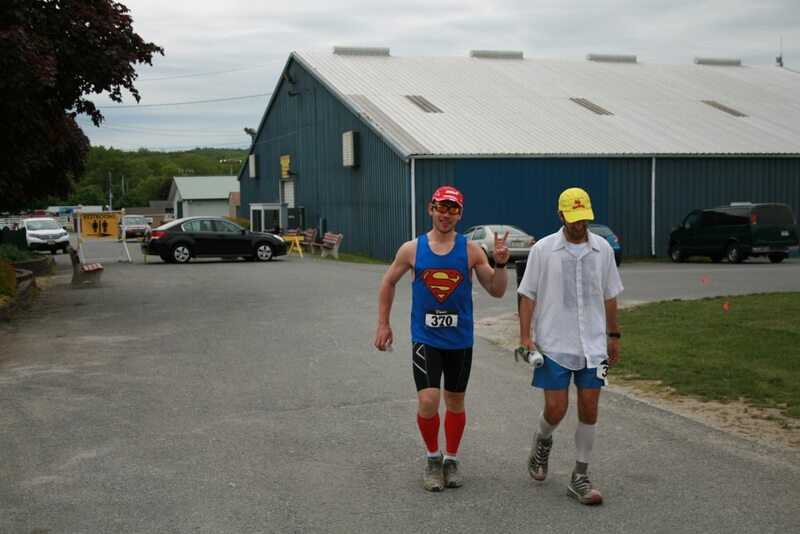 At about 7 pm, after almost 2 and a half days of motion, the two of us crossed the line at mile 200 together. When I made it around to my tent, I decided to walk in one more lap for good measure just in case I couldn't move when I woke up later. I wanted at least 1 mile over 200. 15 minutes later when I got back to my tent, I crawled up, dove in, set my alarms for 2 hours and was out in seconds. 3 and a half hours later I woke up in a panic and realized I had slept through my alarms. I checked them and they were both set to a.m instead of p.m. Dammit! Then I realized how lucky I was that I woke up at all. I figured it was only an extra 1.5 hours and I needed it badly, so I just laughed it off as providence. I got up with a smile and walked back in to the finish to top out mile 202 and get some much needed food. I was expecting to have lost a lot with my placement, but when I checked the tally, I was surprised to see I was still in 3rd. Dave had also slept but only for 2 hours. He was now 5 miles up on me. The runner that was 8 miles behind me was now tie with me, but was currently sleeping. I was surprised that I honestly didn't really care though. It just didn't seem that important, but still I felt compelled to get out and bust out a few more. Let see how far this train can go I thought. Throughout the wee hours I slowly moved along, I was almost entirely walking at this point. I'd shuffle a bit here and there, but the true running was few and far between. When I saw Marylou still out on the course I was ridiculously excited to find out that she was almost to 230 miles. I did the quick math in my head, and it was truly looking like she was going to pull it off. I was so excited for her. I just hoped that she could stay awake. The night dragged on but eventually hints of the morning light began to creep over the horizon for what was my third sunrise on the course. 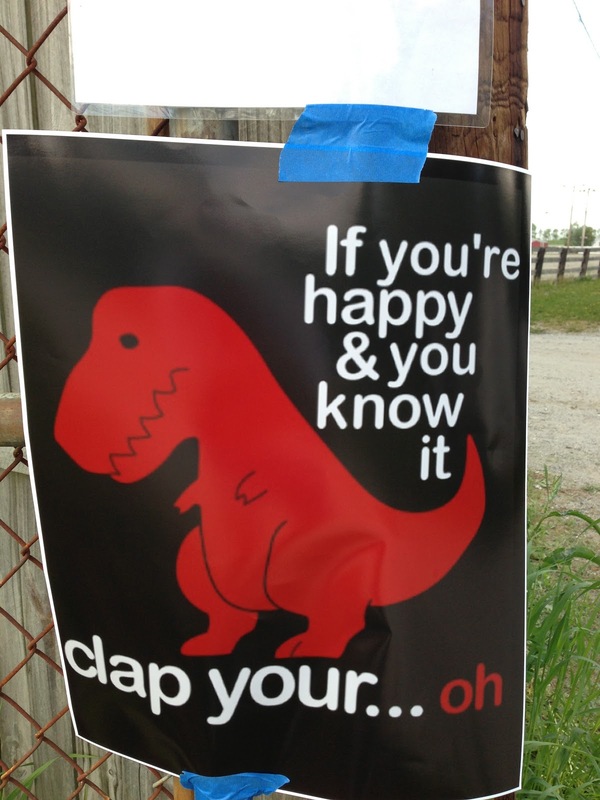 Darren was up over 250 miles now, and Serge was still moving as gracefully as ever...now over 115 miles. At some point around 6:30 am I finally hit 220 and was fairly content with the fact that I was going to be able to walk my way to a 225. I would make my "secret goal". Dave was still 2 miles up on me, and I had no intention of trying to "catch him" and thought more of him as a great running partner than a rival competitor. I was also 10 miles up on 4th place and knew all I had to do was just keep walking. Yet somehow I couldn't help feel that this would be ending on somewhat of a whimper. Here were Marylou, Darren, and Serge all pushing to the end, and I was going to settle with walking in a 225? At 7:30 though something changed. All of a sudden there were less than 2 hours left in the event, and it was possible to start doing some finish math. What I mean is that you start playing games with how many laps can you finish before time runs out. You don't want to finish a lap with say 6 minutes left on the clock...as there's now way you are going to bust out a 6 minute mile after over 200. I starting thinking about how I could best maximize my effort and found that Dave was right on board with me. He wanted to go out with a bang as well....none of this whimper crap. The whole experience was exhilarating and filled us both with some last-minute adrenaline. ...and we ran. We kept adding "one more mile" with conversation points about how, "if we can do a 10 minute mile this lap, it will leave us 11 minutes for one more"....etc. In the end we ran the last 7 miles together with only short walk breaks. We were so worried during the 2nd-to-last mile that we wouldn't have enough time for one more, that we actually pulled of a 10 minute mile. That may not sound fast....but after 230 miles, a 10 minute mile is unthinkable to me. We cross the finish together with about 2 minutes left in the race and I collapsed on the grass as my adrenaline was now depleted. Serge crossed the line just in front of us with 151 miles total for his 24 event, Darren had powered out 276 miles total, not only breaking his 270 from last year, but surpassing his goal of 275. And then there was Marylou. She had crossed the line a few minutes prior having not made the 252 miles needed for the record. Instead, she had gone 253. As I was racing that 2nd-to-last loop with Dave, I passed by her walking her final lap while holding her husband's hand...and I knew she had done it. I just didn't know she had actually passed it by an extra mile. The best part was that the stories of Darren, Serge, and Marylou were just three of the countless stories of triumph that happened over the weekend. I was moved by so many examples of accomplishment and I walked away from an event I wasn't even sure I was even going to like at all...completely floored. What an amazing weekend indeed. My final tally was 231 miles; Dave's 233. My daily splits were: 95 miles on day 1, 70 miles on day 2, and 66 miles on day 3. Lastly...thank god for my Hokas. My knee pain never came back, and other than a blister under my big toenail, I had no major foot problems. Today my knee is hurting a fair bit, but the feet are doing surprisingly well. That's it for now. Hike on everyone and if I learned anything this weekend, it's that sometimes the things we'd never expect to surprise or fulfill us at all, are things that can surprise or fulfill us the most. The volunteers and kitchen staff were incredible, and the food always plentiful and delicious. As always my thanks go to the race directors and volunteers for making the event so memorable. awesome john! I kept watch over you all 3 days and you were amazing. I have never had the desire to try such an event, but after watching it all from home this year, I am determined to give it a go in 2014. great report and great run. congrats! Great run John. You finished strong!